Music and Lyrics by Tim Minchin, Book by Dennis Kelly, based on a story and characters by Roald Dahl. Sprung from the singularly quirky mind of Roald Dahl, Matilda is filled with wildly eccentric characters, dark comedy, childhood hopes and nightmares, and a pinch of the supernatural. The tale centers on a young, highly intelligent girl growing up in a family who, when not mocking Matilda, ignore their lonely wunderkind. Matilda finds some happiness in the local library, and upon starting school finds a soul mate in the sweet Miss Honey. But the intimidating headmistress Miss Trunchbull, gleeful in her policy of corporal punishment with torture devices and a knack for the hammer throw/pigtail toss, will keep Matilda and her hapless classmates from finding happiness if it�s within her powers. Though Matilda finds she has some powers of her own. Dennis Kelly and Tim Minchin capture the story�s magic and madness very well, add a couple great new songs to the American musical theatre canon with Revolting Children and When I Grow Up, and have launched a huge Broadway hit as well as a definite future hit on the youth theater circuit. 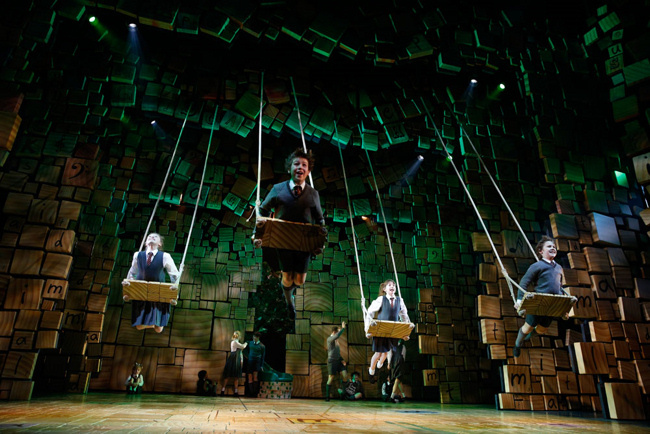 The Broadway production directed by Matthew Warchus is a feast for the eyes with the letter-tile set (Rob Howell) and beautiful lighting (Hugh Vanstone), not to mention Paul Kieve�s magical tricks, but it all doesn�t overwhelm Matilda�s story. 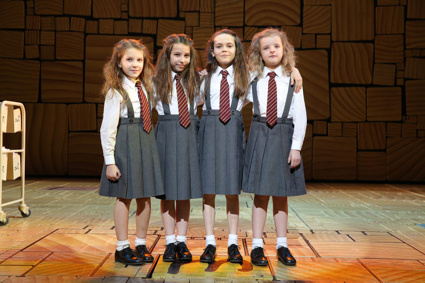 They keep a four-girl rotation of Matildas who, as a group, were recognized by the Tony Awards. My night saw Oona Laurence lead the way � big, soulful eyes imbued at times with unquenchable curiosity, at times with sadness or earnest hopefulness, at times with mischievousness when she�s being �a little bit naughty.� Lots of personality and strong vocal and dancing skills has her keeping the heart of the story beating strong. She shares the stage with a host of remarkable adult stage veterans. Bertie Carvel is a marvel as the hilariously frightening Miss Trunchbull who is just as comfortable with ribbon dancing as he/she is with medieval instruments of torture. Body language, voice, and a perfect blend of evil and comedy. 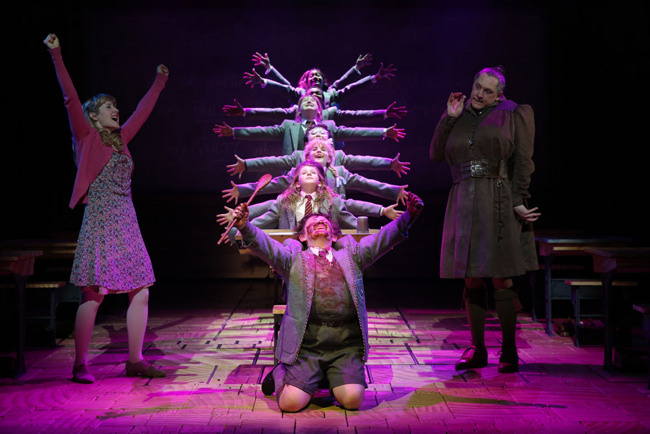 Gabriel Ebert and Lesli Margherita are a hit as Matilda�s zany, self-absorbed parents who would drive any sane kid to seek refuge in the library. Karen Aldridge gives a lovely portrayal of the kind and captivated librarian. And Lauren Ward is riveting as the loving but fearful teacher whose genuine tenderness could change a lonely little girl�s world if Miss Honey can find the courage. And then there are Matilda�s classmates. 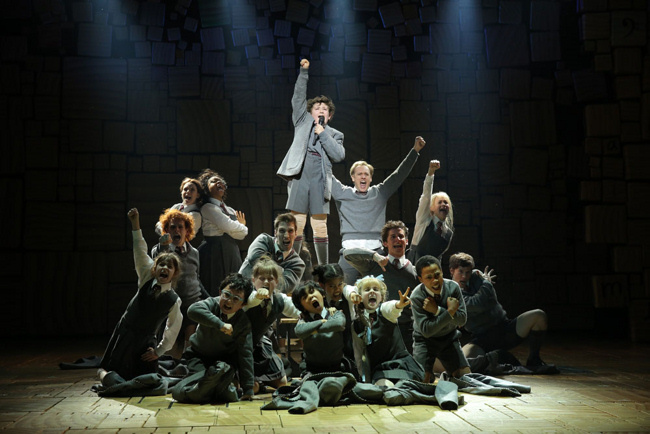 All revoltingly talented young actors who dazzle and delight throughout with their personas, singing, and spot-on dancing to Peter Darling�s brilliant and creative choreography. Frenie Acoba is close friend and newt-handler Lavender, Jack Broderick is Bruce the cake eater, and Beatrice Tulchin is Amanda who gets a traumatic upbraiding by Miss Trunchbull (one of many great illusions in the show). Along with Jared Parker as Nigel, Ted Wilson as Eric, Madilyn Jaz Morrow filling in nicely for regular Ava DeMary as Alice, Emma Howard as Hortensia, and Judah Bellamy as Tommy, these kids combine for many highlights including the little Veruca Salt-ish �Miracles� at the opening birthday party, the fun and catchy Revolting Children, and so beautifully capturing the essence of the story in the charming When I Grow Up � not needing any clever illusions for the visually compelling staging that includes the children swinging playfully above the stage and audience, daydreaming of a utopian adulthood that can always be aspired to, and with a pinch of magic we might eventually find.